70 years ago, John Lennon was born. 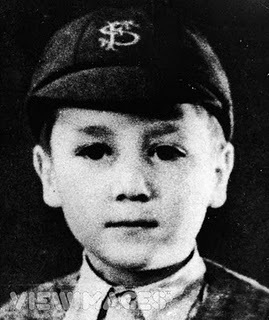 Being the son of Julia and Alfred Lennon, he was named after his paternal grandfather, John “Jack” Lennon, and Winston Churchill (as his complete name was John Winston Lennon). Lennon’s father, a merchant seaman during World War II, was often away from home and sent regular pay cheques. The cheques stopped when Alfred Lennon went absent without leave in 1943. When he eventually came home in 1944, he offered to look after the family, but his wife (who was pregnant with another man’s child) rejected the idea. Under considerable pressure, she handed the care of Lennon over to her sister, Mimi. In July 1946, Lennon’s father visited Mimi and took his son to Blackpool, secretly intending to emigrate to New Zealand with him. Lennon’s mother followed them, and, after a heated argument, his father forced the five-year-old to choose between his parents. Lennon chose his father—twice. As his mother walked away, Lennon began to cry and followed her. Lennon then lost contact with his father for 20 years. “Nowhere boy” is relevant for revealing this period of Lennon’s life. You can read more here. Hi, Lon! So glad you like it! Thanks so much! I got this web page from my friend who told me concerning this web page and at the moment this time I am visiting this site and reading very informative posts at this place. Thiis is a topic which is close to my heart… Thank you!